It happened at a Measure 88 meeting. Vignette: A woman smugly asserts “my only crime is loving my neighbor” (which apparently only extends to law breakers, not protesters whom she hopes to imply don’t love their neighbors), a man taking a selfie and a young woman who is a Bus Project and Causa apparatchik who believes her cell phone camera will intimidate protesters. It was a clash between those attending a meeting about Measure 88, an Oregon ballot measure to give illegal aliens driver cards, and protesters yesterday in Portland. It didn’t need to be a clash. 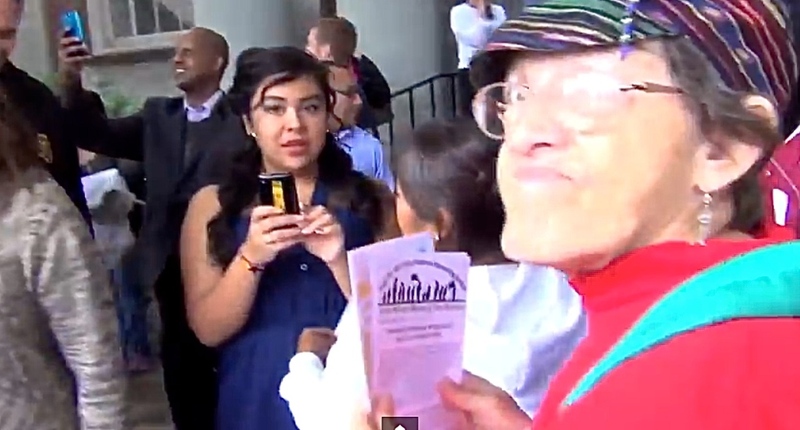 Opponents of giving illegal aliens driver cards–and legal imprimatur–quietly protested outside a Portland church. When the meeting broke up, protesters were harassed and their signs and presence blocked by people whose only crime, as the self satisfied woman above said, “is loving my neighbor.” I give Laughing at Liberals mad props for not laughing in her face. A small band of protesters showed up and were immediately harassed, ridiculed, blocked, and interrupted when trying to do interviews with TV stations. On hand supporting the lawlessness were Governor John Kitzhaber, staterepresentative Lew Frederick, Pastor WJ Mark Knutson, Reverend Kate Lore, Tom Chamberlain (Oregon AFL-CIO), Reyna Lopez (currently with Causa, former Bus Project organizer), Graham Trainor (organizer with AFL-CIO), and a few local TV stations who completely botched trying to ask the governor the tough questions as he slithered out the back door. Just because you believe in national security doesn’t make you a bigot. Just because you think it’s foolish to give legal imprimatur to people who broke the law doesn’t make you a bigot. Just because you take a stand against giving American ID to people who will parlay that into other ID’s and use it to do –what, exactly?– doesn’t make you a bigot. Activists have to cloak themselves–literally–in the idea that giving a driver card to an illegal alien is somehow a moral imperative. Reverend Kate Lore, “social justice” minister for the First Unitarian Church, wants to help people break immoral laws, but then has a hard time explaining what exactly an “immoral law” is, and seems perplexed by realistic situations where immoral laws would be broken that are counter to what her church supposedly stands for. 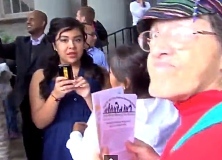 All the while, her church is supporting a political rally that welcomes illegal aliens. Measure 88 supporters have lied about the proposal. They’re asserted the driver card could not possibly be used as an official ID card. That is not true. In fact, Lars Larson checked with TSA to find out if such cards to be used to get on planes. TSA said yes. Illegal aliens –visitors who overstayed their visas–who had multiple driver’s licenses between them, pulled off the 9/11 hijacking. It is for national security reasons Oregonians fought hard to stop giving out driver’s licenses to people who were illegally in the state. Now these same simpletons want to place national security on par with their good intentions. Do you trust these people to make the right decisions for the security of Oregonians? Me neither.